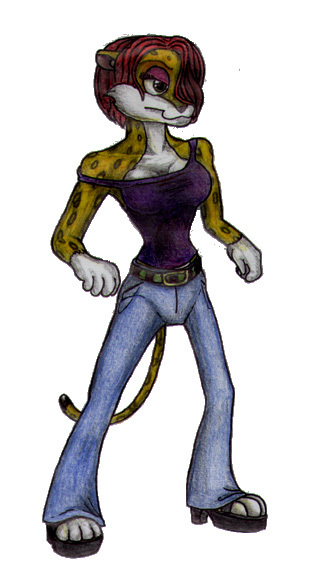 A sexually promiscuous female jaguar. Sandra has had a pretty easy life. She was born in Metazoa State's capital city, and lived in a wealthy neighbourhood. Her father was an attorney until she was fifteen years old, at which point he was elected mayor. By the time Sandra was seventeen, her father had been elected Metazoa State representative. Her mother, a doctor who teaches several classes in Metazoa State Med. School. Both her parents are University of Metazoa alumni and make contributions in the tens of thousands of dollars each year to the college, ensuring Sandra's enrolment. Sandra spends a great deal of her time partying and yiffing, rarely cracking a book. However, because of her family name she gets a free ride in school. She never does homework and shows up for classes less than once a week, yet she gets straight A's and somehow has a perfect attendance record. Marital Status: "Engaged" to twelve men in Metazoa State alone.